Div: Divide edges. Similar to Edit Mesh. Cut: Cut Edges. Similar to Edit Mesh. SlicePl/Slice: Slice Plane. Similar to Edit Mesh. Turn: Turn Edges. Similar to Edit Mesh. Flip: "Flip" Edges. This means all polygons bordering this edge are flipped. Useful when creating new polys by shift-dragging edges. 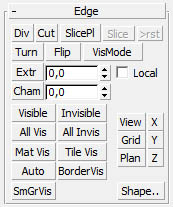 VisMode: Sets eges visible or invisible with one click. Clicking with Shift key pressed deselects. Extr: Extrude. Similar to Edit Mesh. Local: Extrude Normal local. Similar to Edit Mesh's Normal:Group/Local Option. Cham: Chamfer. Similar to Edit Mesh. Visible: Set selected edges visible. Similar to Edit Mesh. Invisible: Set selected edges invisible. Similar to Edit Mesh. 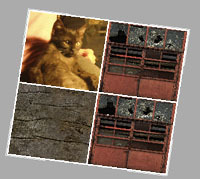 MatVis: All edges, where the material id change, become visible, plus the border. All others become invisible. TileVis: All edges, where the material id change, where the mapping changes, plus the border become visible. All others become invisible. This won't work correctly in some cases of mirrored textures. SelOpen: Select open edges. Similar to Edit mesh. This button has become more or less obsolete, because of the "Open" button in the selection panel. This button always selects the invisible edges too (in opposite to the "Open"-button, where invisible edges are not selected (if object has "Edges Only" flag). BorderVis: All edges on the border (open edges) become visible, all other invisible. SmGrVis: Set edge visibility by smoothing group. Planar: Make planar. Similar to Edit Mesh. Shape..: Shape from Edge. Similar to Edit Mesh.